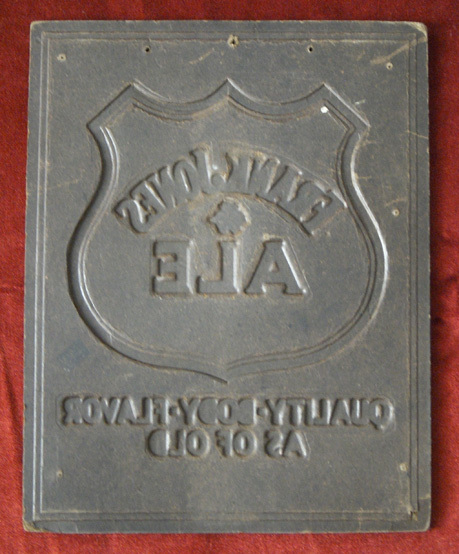 SUBJECT: This is a post-Prohibition pressed board sign from the Frank Jones Brewery in Portsmouth, New Hampshire. Frank Jones was an iconic figure, businessman and politico in the latter half of the 19th and early 20th century New Hampshire. The sign is black with gold details and shows a red badge-shaped logo that reads FRANK JONES ALE, with the motto QUALITY-BODY-FLAVOR AS OF OLD below. The sign is not very thick, but the outline of the shield logo, all lettering and border are raised. SIZE: Approximately 12-7/8 diameter and 10-1/8 width. ATTACHMENT: Two holes at top for hanging. CONDITION: 7 (Very Fine): Sign shows moderate wear with a few small puncture holes and nicks along border.